It’s hard not to lust after this gorgeous, albeit it slightly odd British Vogue cover from 1977. Shot by Willie Christie with Make-up by Barbara Daly using Max Factor, the image is a close of a model holding a slab of Rowntree’s green jelly up to her lips. Nails are lacquered red, lips are painted scarlet against perfectly white teeth and the almost garish hue of the jelly. The idea behind the unusual snap being that jelly is full of gelatine, a valuable source of protein and good for strengthening nails. 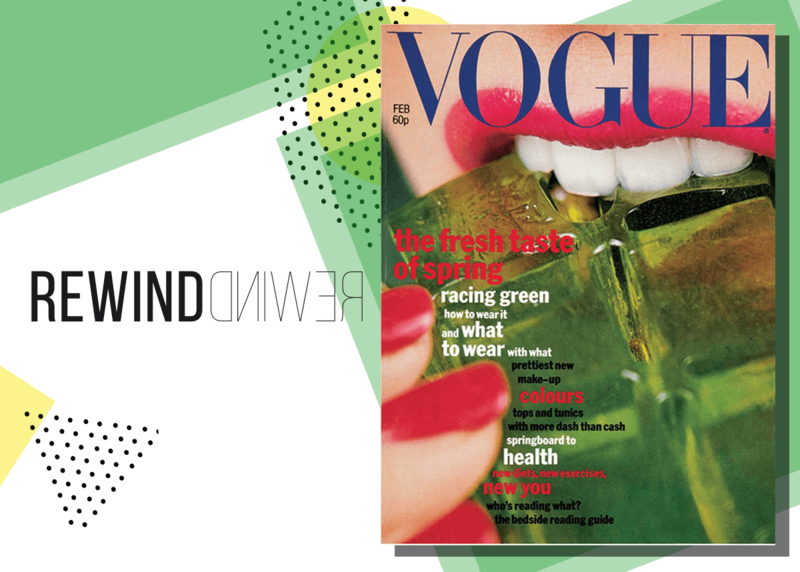 Green is the colour of the fashion moment inside, modelled by Jerry Hall, while Maria Schiaparelli Berenson's wedding to James H Randal is featured, with Anjelica Huston, Jack Nicholson, Liza Minelli, Halston and Andy Warhol all there to see it. "If there was ever such a thing as a groovy wedding, that was it," said Nicholson. But the best thing of all about this superbly psychedelic issue, is that it costs just 60p. Now that is mind bending.